What Are the Causes of Dark Underarms? Underarm discoloration is a problem many individuals find embarrassing. It affects men and women of all ages, though the Mayo Clinic notes that it affects women of African and Hispanic descent more than any other demographic. There are a number of causes for this condition, and the treatment of the problem relies on the cause. Dark underarm discoloration can be caused by a medical condition known as acanthosis nigricans. While it can affect otherwise healthy people, acanthosis nigricans is frequently found in individuals with insulin disorders, according to the Cleveland Clinic. Diabetes and insulin resistance are two major causes of acanthosis nigricans. It is also found in individuals with Addison disease, pituitary problems, hypothyroidism, or those undergoing growth hormone therapy, using oral contraceptives or cholesterol medications containing nicotinic acid. It can affect any part of the body with folds, including the underarms. Areas affected feel velvety and are a dark gray or brown color. Speak to a doctor about steps you can take to control your insulin levels and minimize the appearance of acanthosis nigricans. Shaving your armpits may give them a dark, discolored appearance. Shaving cuts the hairs at the surface of the skin. If you have hair that is darker than your skin color, the stubble will show up as a dark stain, according to The Beauty Brains website. Instead of shaving skin, consider waxing or tweezing the hairs. These procedures remove hair below the skin's surface and reduce the visibility of the hairs. A bacterial infection known as erythrasma can be a culprit in producing dark underarms. The infection, caused by the Corynebacterium minutissimum bacterium, begins appearing as pink patches. The pink spots turn into brown scales. It is more common among individuals with diabetes mellitus, according to the National Institutes of Health. It affects more individuals in warm climates than those in cold. Erythrasma is treated using oral or topical antibiotics. A 2002 publication from the Department of Internal Medicine at Lakeside Hospital in Metairie, Louisiana, cites a nearly 100 percent effective treatment as an oral course of the antibiotic erythromycin. 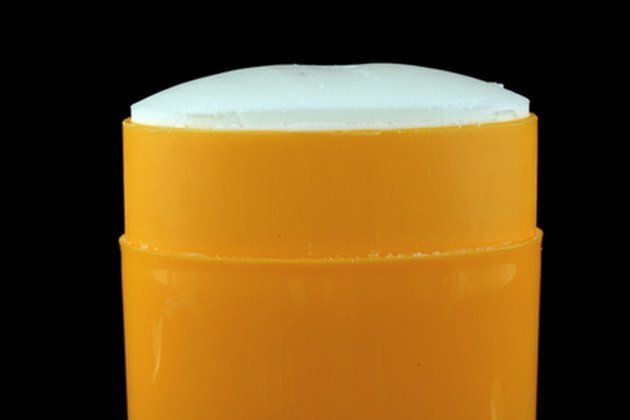 Ingredients in antiperspirant products could react with the skin or individual body chemistry to cause discoloration. The Beauty Brains website claims that this is practically ineffective, but notes anecdotal evidence where people have stopped using antiperspirant and deodorant combination products who have observed the cessation of underarm discoloration. The website recommends switching brands of antiperspirant or switching to a deodorant-only product.